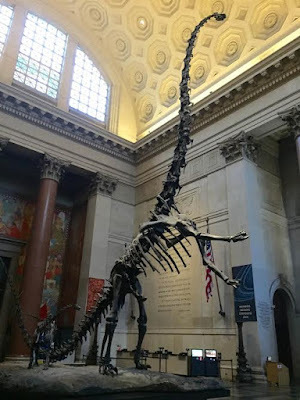 I figured that since there is so much hype going on currently about that new titanosaur, we should use this week to honor... the other famous sauropod on display in New York! Check out Barosaurus lentus! Barosaurus was a large sauropod dinosaur that lived in what is now the Western United States, during the Late Jurassic period, about 150 million years ago. When alive it ate plants and adults could have grown to be about eighty five feet from snout to tail. The genus name, Barosaurus, translates to "Heavy Lizard/Reptile" because well...look at it. Could you lift one? I don't care how much you skip leg day at the gym nobody is lifting that guy. Within the sauropod group, Barosaurus belongs to the family, diplidocidae. Diplodocids are characterized by having relatively long snouts with thin, peg-like teeth in the front of the mouth. (Although a skull from Barosaurus, itself, hasn't been found.) They also all had extremely long tails that tapered down to a thin whip, which they may have used as weapons against rivals and predators. Diplodocids also tended to have shorter front limbs than hind limbs, putting their center of gravity over the hips. This may have allowed them to have reared up on their hind legs, using the strong tail to make a third "leg" for short periods of time if they needed to. Brontosaurus, Apatosaurus, and Diplodocus (duh) were also diplodocids. 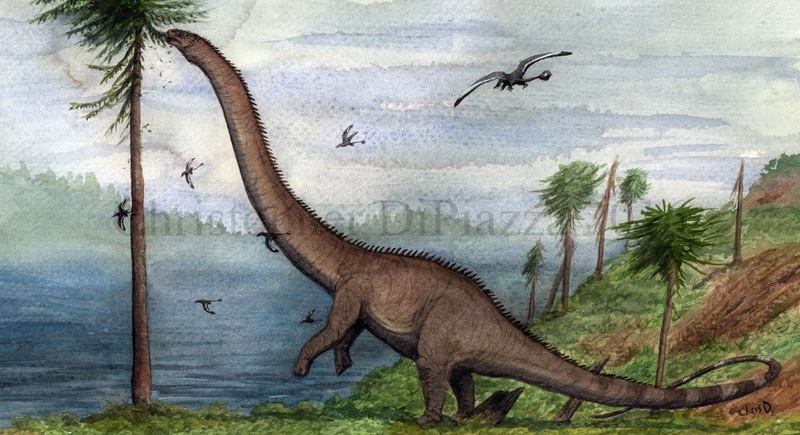 Compared to its relatives, Barosaurus had a longer neck, shorter (still pretty long, though) tail and a shorter body. Since there were so many different species of sauropods that lived at the same time and place during the late Jurassic, alongside Barosaurus, we tend to notice slight differences between them, especially when it comes to neck length. This may have been an example of niche partitioning, which is when similar species of animals have evolved slightly different lifestyles to avoid competition with one another. In this case, Barosaurus may have used its longer neck to take advantage of foliage at a level that was unavailable to shorter sauropods. It also may have used this neck to sweep across vaster expanses of low-growing plants to eat, without having to actually move its body. Barosaurus' neck vertebrae were long and hollow, with lots of openings around them. These bits of space around the bones are called pleurocoels, and were probably adaptations to make the dinosaur's long neck as light as possible so it could keep its head off the ground. They also may have provided space for muscles responsible for pumping blood to the brain. Barosaurus skeletal mount at the American Museum of Natural History in New York. The American Museum of Natural History has probably the most famous Barosaurus skeletal mount, of an adult rearing back on its hind legs to defend a baby against an attacking Allosaurus. This scene is right in the front entrance and is the first thing you see when you walk into the museum. When I was six years old and saw it for the first time, my head almost exploded. It is important to note, however, that a lot of this scene is speculation. We really have no proof that sauropods cared for or protected their young in this fashion. In fact, we have some evidence that some kinds really didn't do much parenting work at all, beyond burying their eggs after laying them. Also, some of the bones this Barosaurus mount is based on have since been assigned to a different genus, called Kaatedocus. The overall shape of the creature, however, is still identifiable as Barosaurus. That is all for this week! As always feel free to comment below or on our facebook page! Dingus, Lowell. "Sauropodomorphs." The Halls of Dinosaurs: A Guide to Saurischians and Ornithischians. New York: American Museum of Natural History, 1995. 18. Print. Foster, J. (2007). "Appendix." Jurassic West: The Dinosaurs of the Morrison Formation and Their World. Indiana University Press. pp. 327-329. Lull, Richard S. (1919). "The sauropod dinosaur Barosaurus Marsh: redescription of the type specimens in the Peabody Museum, Yale University". Memoirs of the Connecticut Academy of Arts and Sciences 6: 1–42. McIntosh, John S. (2005). "The genus Barosaurus Marsh (Sauropoda, Diplodocidae)". In Tidwell, Virginia & Carpenter, Ken (eds.). Thunder-lizards: The Sauropod Dinosaurs. Bloomington: Indiana University Press. pp. 38–77.